What ever happened to spring? Los Angeles is getting a taste of summer this week. Beach trip in February? This is why I love Southern California. While I have been enjoying the sweater weather of January, I definitely cannot complain about all the sunshine. It puts me in such high spirits. 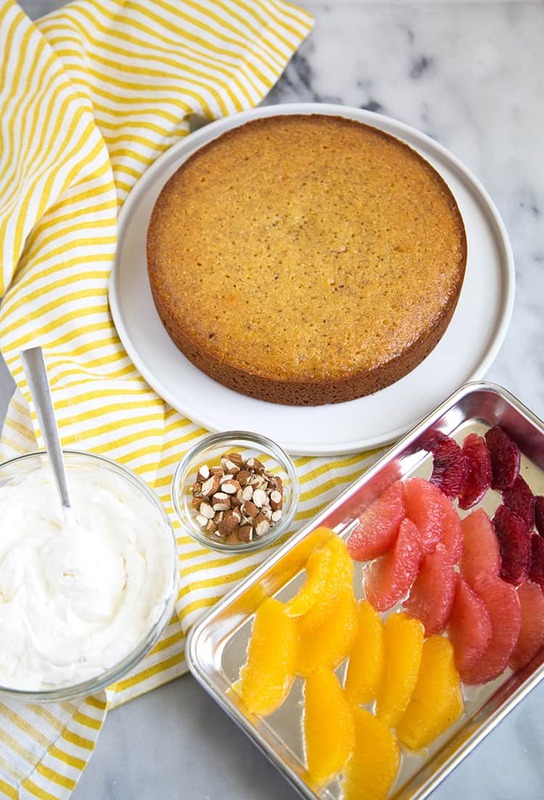 It makes me just as cheerful as a slice of this almond honey cake with citrus and cream. Just like my previous coconut confetti cake, this cake also screams happy! Maybe it’s that yellow striped dish towel? Perhaps it’s all the colorful citrus on top? While February is unofficially the month of chocolate (thank you, Valentine’s Day), it’s my favorite time of year to bake with citrus. The abundance of grapefruit and blood oranges makes me giddy. I love the bright colors and the even brighter flavors they bring. This cake is very simple to put together. 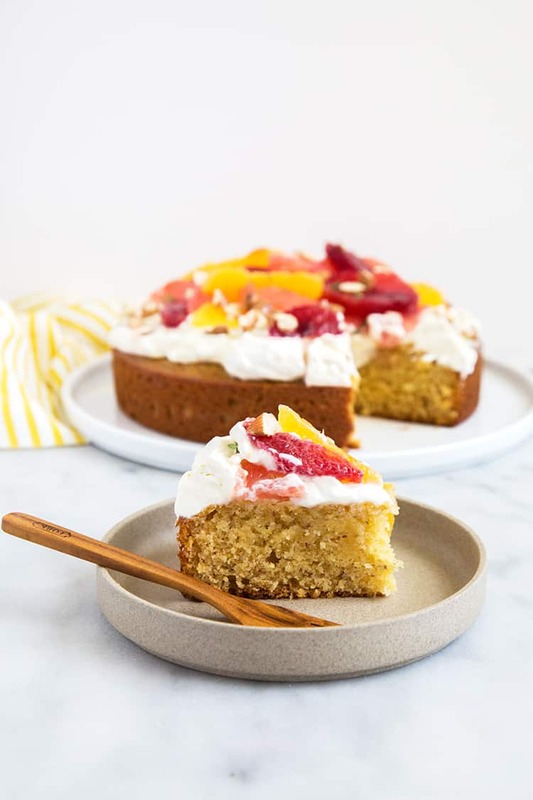 It’s a standard one layer cake topped with a luscious cream and adorned with a variety of citrus segments. This cake has no sugar. All of it’s sweetness comes from honey. The cake itself is pretty dense due to the mixture of cornmeal and almond flour. 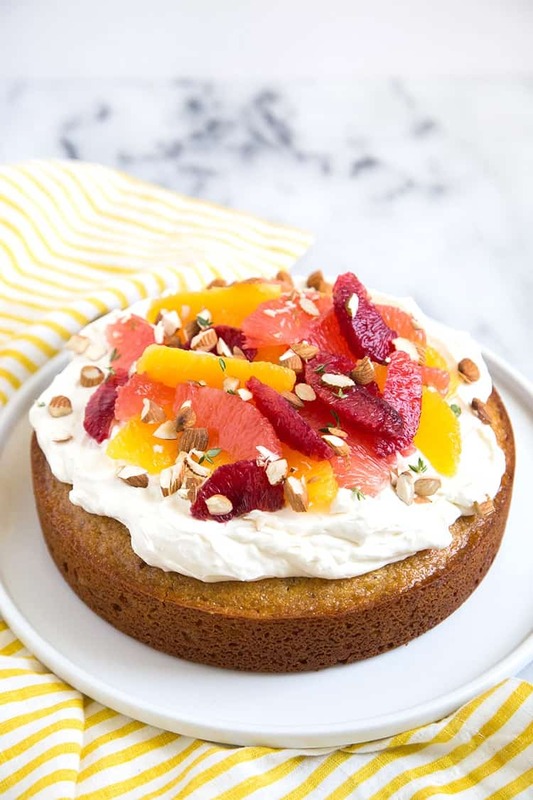 To bring moisture to the cake, after baking it is soaked with an orange juice-honey syrup. This syrup also imparts an amazing floral scent and flavor. 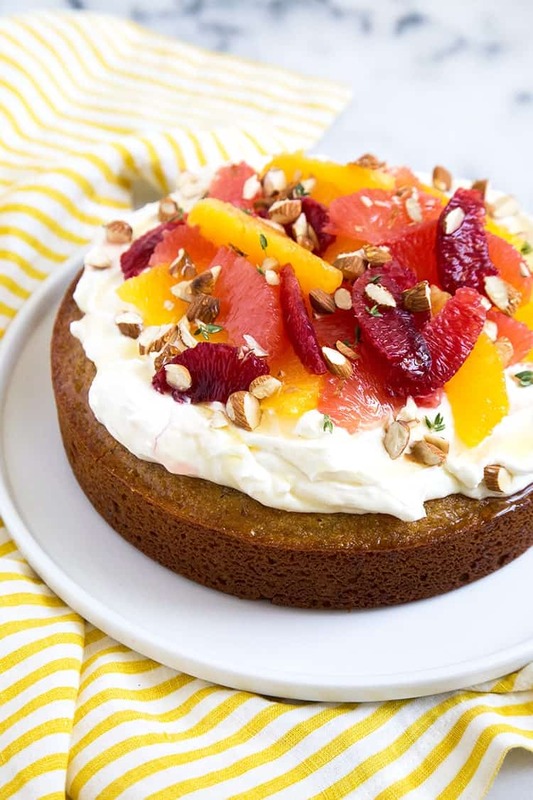 It you need a break from the chocolate madness of February, give this citrus almond honey cake a try. It’s a definite departure from the rich, decadent, and sinful desserts out there right now. Plus, this is the kind of cake that is totally suitable for breakfast! For the full recipe, visit BHG’s Delish Dish blog. Preheat oven to 325 degrees F. Grease 9-inch round cake pan and line bottom with parchment paper. In a large bowl, whisk together flour, cornmeal, ground almonds, baking powder, and salt. In the bowl of a stand mixer fitted with paddle attachment (or using an hand mixer), cream butter until smooth. Add honey and continue to beat until fluffy. Add eggs one at a time until thoroughly combined. Add half of the flour mixture and mix on low speed. Mix in milk followed by the remaining half of flour mixture. Mix until there are no longer any dry streaks of flour. Transfer batter to prepared cake pan. 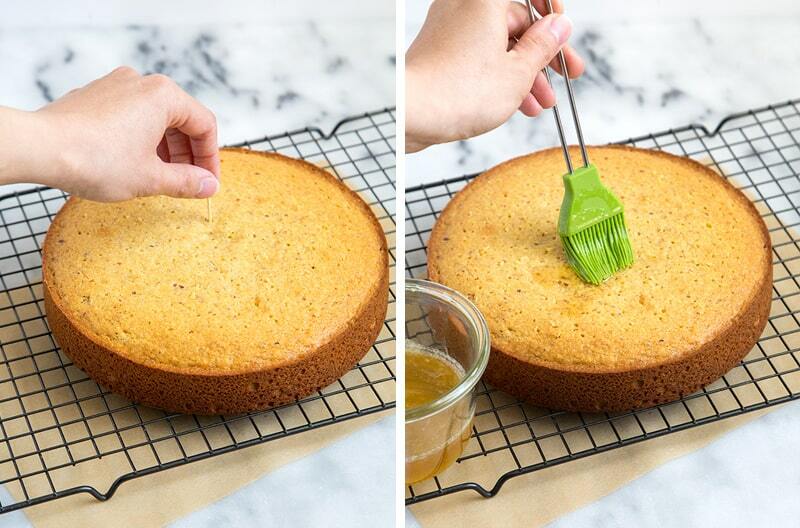 Bake for 30-35 minutes until a toothpick inserted in center of cake comes out clean. Allow to cool in pan for 5 minutes before unmolding. To make SOAKING SYRUP: Heat honey and orange juice over the stove until honey has dissolved. Poke warm cake all over using a toothpick or the tines of a fork. Brush soaking syrup all over warm cake until absorbed. Allow cake to cool to room temperature on a wire rack. TOPPING: Before serving, whisk mascarpone until smooth. Add heavy cream and honey. Beat to soft peaks. Spoon over cooled cake. Top with citrus segments. Enjoy immediately. What a truly beautiful cake! I am so impressed with the gorgeous fruit and your absolutely stunning photography! i love tightly crumbed cakes (i’m still not into the super fluffy and light asian cakes), so this is right up my alley! on a semi-unrelated note, have you tried honey butter almonds? my friend brought some back from korea recently, and they’re just as tasty as they sound. This cake is glorious! It just sings of spring and sunshine! I love that it is sweetened entirely with honey. A friend of mine is an apiarist and his honey is so lovely that it deserves to be the star of the show in this cake. I’ll be making this as soon as the next batch comes in! Love that there’s no sugar in this cake! I always feel so guilty after pouring 1 whole cup of sugar into the mixing bowl whenever I’m baking desserts. Presentation of this cake is on point!! So naturally beautiful, this could be my birthday cake! Love this!! !